Wellington proudly offers its new practical table base. This base has been designed from the ground up to meet the needs of the working professional. • No tools are required for assembly and there is no loose hardware. • The legs fold for packing yet lock securely in place. • The striking design complements any stage setting. 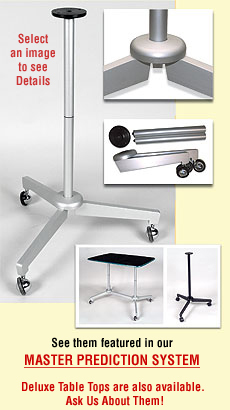 • Supplied with high quality Shepard casters – no plastic here! • Three point base design means that the table will stand securely without wobble – no levelers required. • Specially machined top flange is 4 inches in diameter for solid support. • Center column is made from thick wall aluminum tubing designed to resist denting. • Column unscrews at center using heavy-duty threads that are virtually impossible to cross thread. • Even the Center Table Base, with 2 columns can be assembled by one person in less than a minute! • The black base is also machined from aluminum and black anodized.